An extensive range of precision engineered BSP Gauges are offer by us to our clients. 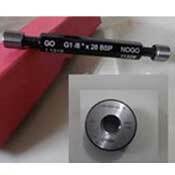 Made up with premium class raw materials steel, chrome and carbide these BSP Gauges are used in many industries for high quality pressure gauge connections. These BSP gauges are prepared in accordance with Global Industrial standards. The BSP Gauges can be produced by us based on the specific requirements provided by the clients at cost effective rates.